This dish is a great holiday side that could easily replace any cream and gravy laden traditional side dishes. This high fiber, nutrient dense dish packs some serious nutritional power. Notably, garlic is an excellent antimicrobial agent and may aid in treatment of high blood pressure. The roasted garlic in this dish is a completely different taste experience than sautéed or raw garlic. Roasting garlic brings out an a sweetness that simply cannot be experienced by other cooking methods. 1. Peel and cube butternut squash. I like bigger chunks for this dish than I would use in a stir fry, but chunks should still be bite size. 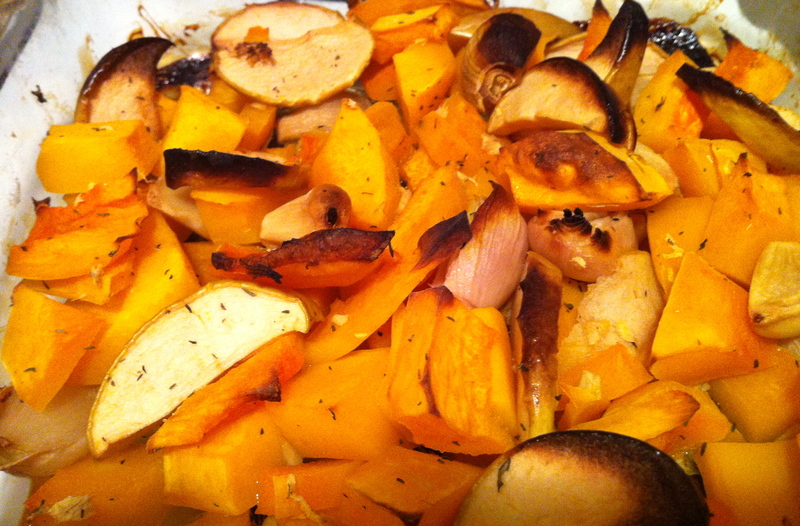 Add cubed squash to roast pan. Practically any oven safe cooking ware will do. I used a square glass pan. 2. 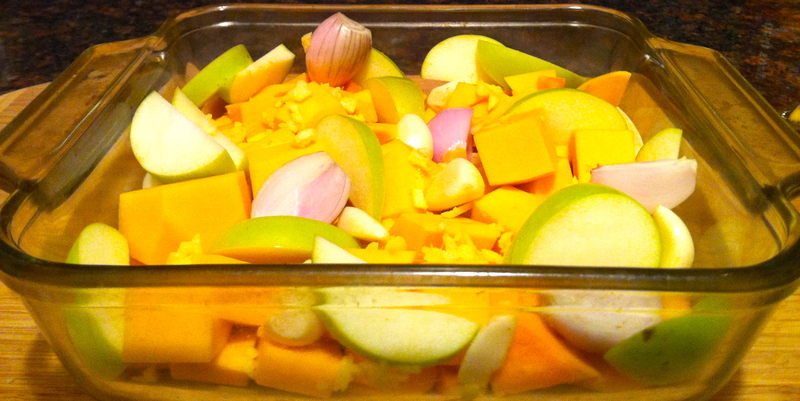 Slice apple and arrange amongst squash. Add peeled garlic and shallots. Sprinkle the ginger on top. 4. Add thyme, to taste. 5. Bake at 350 deg. F. for 45 minutes to 1 hour. All vegetables should be fork tender. 6. Add sea salt and pepper to taste. 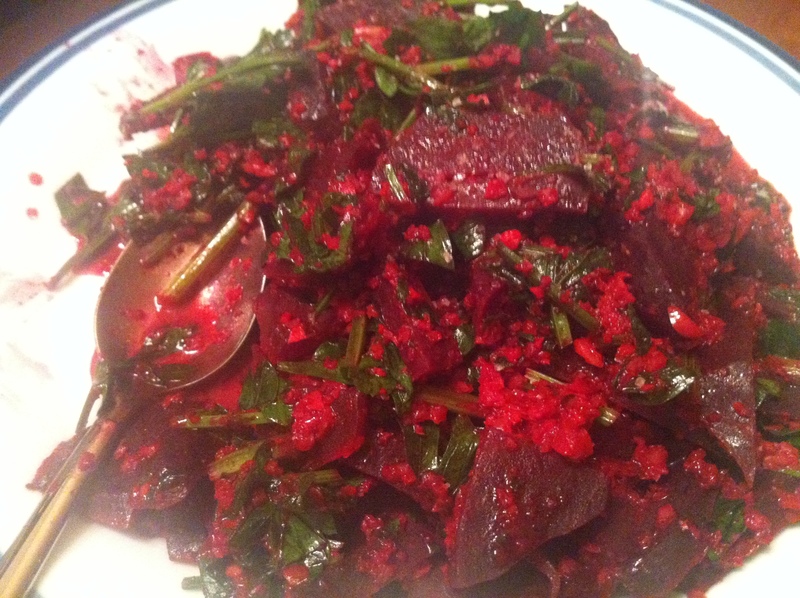 This recipe is courtesy of Mark Bittman from the New York Times, (the original recipe can be found here) and is one of my absolute favorite ways to prepare beets. The preparation time is a bit longer than most of the recipes I feature, but is mostly hands off while the beets are roasting. 2. Wash beets and while they are still wet wrap in foil (individually). Place on a baking pan and bake ~60-90 minutes. Beets are ready when they can be pierced easily by a thin knife. 3. About 20 minutes before beets are done, begin preparing sauce. Heat oil in skillet. 4. Add garlic and sautee about 6 minutes. Add a little bit of water during this time, ~1/3 cup. 5. Add chopped walnuts and let soften about 4 minutes. Add orange juice at ~2 mintues. 7. Place mixture back into skillet. Let beets cool enough to handle and peel off skins. Chop beets into cubes or wedges and add to skillet mixing with dressing. Reheat over low-medium heat. Add chopped parsley at this time, allow to wilt slightly, ~3 minutes. 8. Add freshly ground sea salt and pepper to taste.